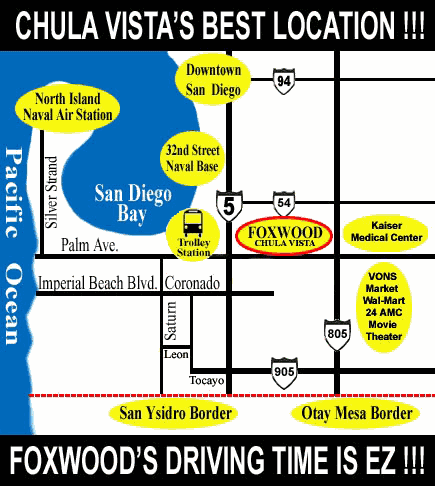 Foxwood Corporate Apartments in San Diego is just 1 EZ block off the 805 freeway across from a 5-acre park and bus route. Vons Market, Wal-Mart, Kaiser Hospital, restaurants, shops and a modern AMC 24 plex movie theater are less than 2 blocks away in the Ocean Hills Mall! Palm Ridge Neighborhood Shopping Center is also right next door! Our San Diego corporate and furnished apartments are located ideally for those working both in downtown San Diego as well as those looking for close access to the US-Mexico border. Our furnished apartments are perfect for business, military, vacation and corporate rentals who require close access to all that San Diego offers. Call us today for more information! The Palm Ridge Shopping Center is right next door to the East and just across the street to the South is the Beautiful 5-Acre Palm Ridge Park. Plus 2 Blocks to the East is the major Palm Promenade Shopping Center! You can also take the Bus to the Trolley Station at two nearby stops next door or across the street. See the Transportation page for information on routes to Downtown, Mission Valley and Tijuana/US Border, San Diego Golf Clubs and Beaches.